The Penguin marks a major breakthrough in the battle to beat health problems created when computer users spend too much time handling a conventional mouse. It sets new standards of protection against a range of upper limb conditions such as repetitive strain injury (RSI) and carpel tunnel syndrome (CTS) by enabling right and left hands to share the workload and avoiding exaggerated movements of the wrist joint that can increase pressure on the soft tissues in the carpel tunnel. Regular switching of hands throughout the day helps prevent static muscle strain (SMS) in the arm and shoulder - a major source of discomfort in mouse work. 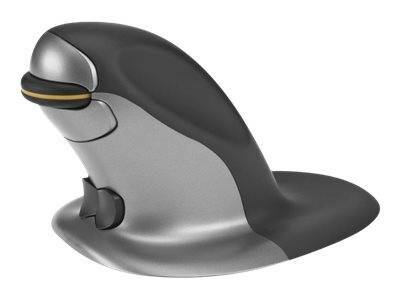 Allows the user to rest either hand comfortably alongside the vertical structure, encouraging the use of the bigger muscles in the fore and upper arm to maneuver the mouse. Fine cursor control is still achievable with small hand and/or finger movements.